Spatial Information Solutions, Inc. (SIS) recently released Topo Analyst, the second product in their suite of map accuracy testing tools. Topo Analyst tests and verifies the accuracy of lidar point cloud data, DEM data, and other raster elevation data such as IFSAR elevation data products. Topo Analyst allows users or clients to be sure they are producing, buying, or using elevation data that meets their accuracy expectations. SIS was formed by Dr. Charles (Chuck) O’Hara in 2006 as a spin-off company from Mississippi State University and provides software technologies for verification and quality assurance of map data. Chuck told me that Topo Analyst quickly rose to the forefront of development when users of their first product, Accuracy Analyst (that tests the accuracy of geo-referenced images against ground-run survey data), asked for a product that could be used in a similar fashion for testing the accuracy of lidar data. As lidar and other elevation data products rapidly evolve, so does the need for a consistent and efficient means of quantifying the accuracy of information. The National Map Accuracy Standards that have been in place since the 1940s are simply no longer sufficient for today’s digital data that can be output at any scale for an infinite number of applications. Likewise, data usage is becoming more complex, and we need flexibility in specifying accuracies that vary based on individual projects. The FGDC addressed that very issue several years ago when it introduced the National Standard for Spatial Data Accuracy (NSSDA) that provides a standardized method for reporting that doesn’t designate a specific threshold but rather delivers a value that can be deemed acceptable or not based on the end user’s need. 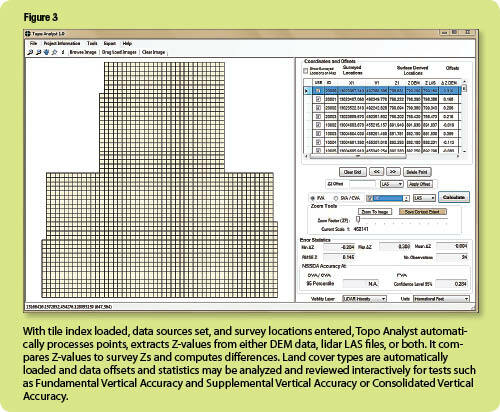 The ASPRS followed suit by incorporating the same standard in their Guidelines for Vertical Accuracy Reporting for Lidar Data. This method of reporting provides tremendous flexibility in data quality assurance, but using manual methods to determine resultant values can be tedious, uncertain, and prone to user error and lack of documentation. That’s where SIS offers a solution. Topo Analyst quickly and efficiently provides all the necessary analysis. But it does more than just calculate error; Topo Analyst provides plots, graphs, and reports that help you understand the accuracy and the quality of data products. It allows producers, customers, and users alike to rapidly review data, accept it for use, and proceed with confidence. Each project starts when you add project information, such as user, vendor, and acquisition data, which is used in the final reports. I like the fact that the user can’t move on until this information is complete. It creates good record-keeping for future users and it ensures that final reports are complete and include important information about the data. In the next step you load the data to be analyzed (Figure 1). 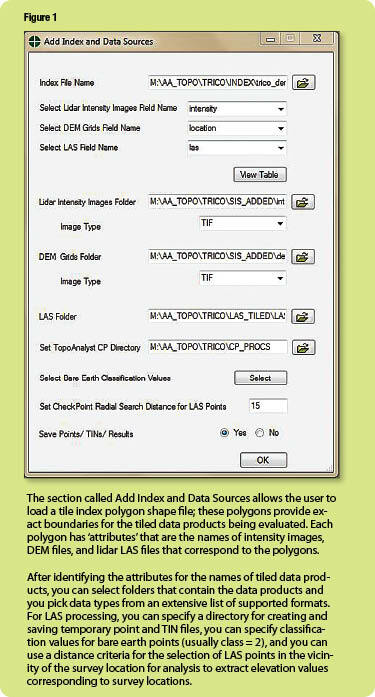 Supported formats include lidar LAS point clouds as well as raster DEM and elevation data. The process is simple and straight forward, thanks to a single dialog where all the data sources and parameters are set in one place rather than making you wade through scattered menus and selections. It is quick and easy to see what is expected, and if you’re not using certain data types, you can simply leave those fields blank. There’s no worry about leaving out required information because built-in checks prevent moving on until you supply the minimum requirements. 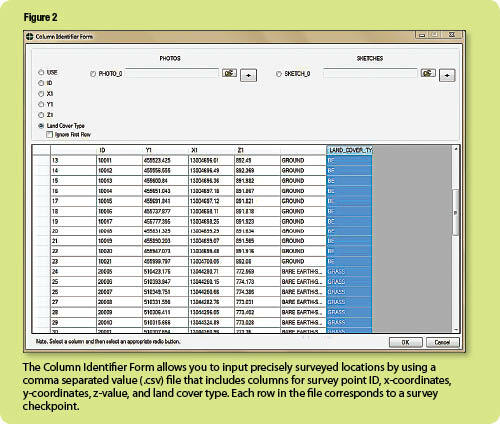 Survey checkpoints are the last item added to the project (Figure 2). The points must be in a .csv file, but the arrangement doesn’t matter thanks to a friendly interface that allows the user to quickly specify which columns contain which data. Once the file is added, corresponding Z values and deltas are automatically computed for each of the attached data sets, and the results are displayed in a table for review. If points have been loaded that need to be excluded for any reason, a simple check box will remove them from the analysis and prompt the user to select a reason from a customizable list. For example, if a surveyed point falls in an area where the lidar data is obscured and unreliable, that point would not provide an accurate data comparison. The reason for exclusion is stored within the project for future reference. Once you load the data and check points, results are ready to be computed. Topo Analyst immediately displays a variety of useful statistics: RMSE, range of elevation differences, average elevation difference, and the accuracy based on NSSDA standards (Figure 3). 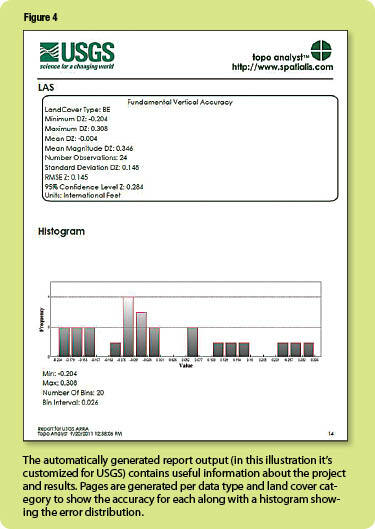 Fundamental vertical accuracy (FVA) is reported at the 95% confidence level for bare earth points while supplemental and consolidated vertical accuracy (SVA/CVA) is reported at the 95th percentile for other ground cover classifications. The analysis settings can be quickly modified and rerun to compare results based on different input parameters. Once you’re satisfied with the results, an automated report is generated capturing all the pertinent data. The report contains statistical information along with charts and easy-to-explain graphs for those not-so-technical clients. The report contents can be easily modified using simple toggles, and in addition to being professional in appearance, can be even be customized with your company’s logo (Figure 4). In addition to testing the absolute accuracy of data from a statistical perspective, it is also important to make a subjective visual analysis. 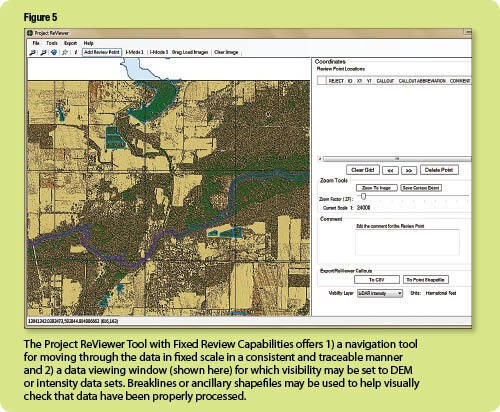 Included with Topo Analyst is the Project ReViewer module that provides the capability to do that. The visibility mode allows either DEM or lidar intensity data to be viewed while breaklines, points, or shape files can also be added for further verification that data has been processed correctly. One of the nice features in Project ReViewer is the fixed scale review function (Figure 5). Its navigation tool allows the user to set a desired scale and move through the data in a methodical manner. A visible tracer trail is left behind that ensures you’ve viewed all data and not wasted time looking at the same information twice. It’s important for producers to know that they are delivering elevation products that meet or exceed the required specifications for a given project. At the same time, customers need to know they are getting what they paid for. Both need tools that enable data to be verified in a cost-effective, efficient, consistent, and standardized manner. I was very pleased with the simplicity and the ease with which data could be analyzed. Even as a newcomer, I got up and running after having viewed little more than a short demo with SIS. Whether you are the producer of elevation data, a user, or the end recipient, Topo Analyst provides extremely valuable information. SIS is currently working on expanded functionality for each of their current products and has plans to release two new products, Linear Analyst and Change Analyst, in the near future. Stuart W. Spencer, PLS is a licensed surveyor in Georgia, South Carolina, and North Carolina and holds an associate’s degree in civil engineering technology. He is actively a project manager for a private civil/survey firm in Savannah, Georgia, where he also consults on software development and oversees training initiatives.